Tablets and smartphones can now be extremely useful tools for people with dyslexia. Many tablets and smartphones come with in-built screen reading and voice recognition features, and there is a vast range of apps available for all platforms to assist with reading, writing, spelling, organisation, study skills and numeracy. 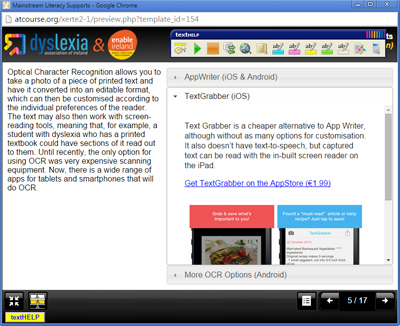 There are also apps for OCR, so that printed text can be captured and read out. DAI runs Tablet Technology and Dyslexia Workshops. The aim of these interactive workshops is to equip delegates with knowledge of how tablet technology and apps can be used to the benefit of people with dyslexia. A range of different apps and tablet features are demonstrated – an Apple iPad is used for these workshops, and apps for other platforms are mentioned throughout. Please visit the Events section of the website for further information and booking forms. An electronic dictionary is an in-expensive, portable tool for checking spelling, e.g. Franklin Spellmaster or Collins Electronic Dictionary and Thesaurus. As long as the individual can make a reasonable phonetic attempt, there is a good chance that the correct spelling can be identified. Some electronic dictionaries also have a thesaurus feature which can help with expanding vocabulary. For those students whose reading is reasonably competent, but where they come across occasional words that they cannot identify, a reading pen may be a good solution. These are hand held pens containing OCR software which enables them to scan and read words and phrases; they also include a dictionary to explain what a word means. Wizcom are one company that make reading pens. Electronic readers such as Kindle, Sony eReader and others have opened up the world of digital books. Some are more basic than others. The Kindle Fire has an in-built screen reader. Mobile versions of software are also now available. Some software can be purchased as a USB key, meaning that the software travels with you and you can use it on any computer, at home, work or in the library, rather than just having your software on one machine in one location.